Cheap smartbands? How about a $13 one from Xiaomi? You are here: GeekSays Technology News » General » Cheap smartbands? How about a $13 one from Xiaomi? Ever since the first wearables were introduced, they weren’t so cheap and not everybody could afford them. Luckily, there are a couple of Chinese manufacturers out there who thought about this. One of them is Xiaomi, which seems to be rising with each day, becoming one of the largest smartphone makers in China, outranking even Apple. And yes, they just released a wristband too, alongside their new flagship device, the Mi 4. Called Mi Band, the device is a fitness tracked which can be paired with a smartphone and use it in order to unlock it, which is pretty cool, as you can avoid inputting the password every time you need to use it for a call, for example. According to Mr. Lei Jun, Xiaomi’s CEO, the Mi Band could shortly become the world’s best selling wristband, as it will be sold for just, hold on tight, $13. Yes, it’s that cheap. Mr. Jun also considers that “once you start using a wristband to unlock your phone, you won’t go back.” I don’t know about you guys, but I kinda believe him. 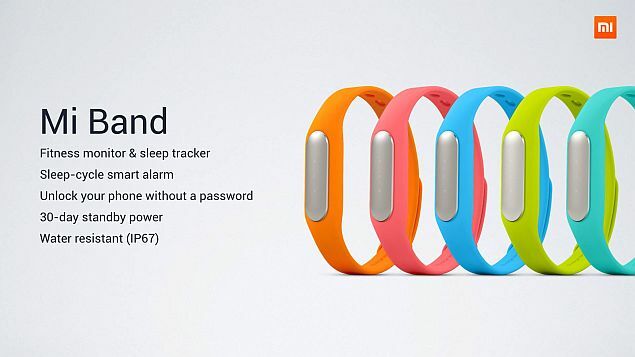 As for other features, the Mi Band is water-resistant and also has an incorporated alarm. No details about its availability were given, but something tells us that when this wristband is going to make it on the market, it will sell like crazy. I mean c’mooon, $13!! If they’re going to keep it like this, Xiaomi has all the chances of becoming an international brand!